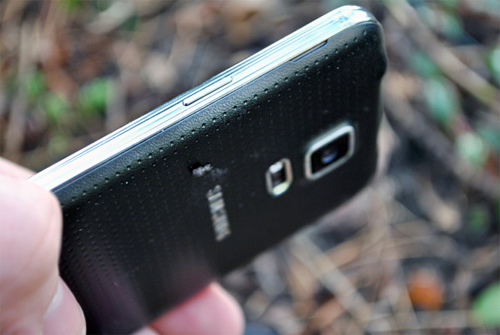 Does your Samsung Galaxy S5 automatically turns off when turned on and then vibrates? Well, you're not alone. In fact, I received several emails asking me how to fix this issue. In one of the emails, the user said the problem started immediately after the phone slipped and dropped head-first to concrete floor. There was also one owner who said the problem just started out of the blue while he was taking screenshots using the hard keys. The phone, according to him, displayed the Power off menu but continued to turn itself, then vibrated. After a few seconds it attempted to turn on, the turned off and vibrated. Let me get straight to the point, the problem is with the Power key--it is STUCK! To get it from being stuck, repeatedly press and release the Power key. However, to avoid data corruption due to frequent turning on and off, remove the battery first so the phone won't power on the Power button is hit. It doesn't matter how many times you press and release the button as long as you can get it out of being stuck. It is also wise to remove all cases or covers if you have one. The normal Power key snaps when you press and release it. If it doesn't do that anymore, either the key is still stuck or totally damaged. The good thing is the Galaxy S5 uses a universal switch so you can buy the component and have a technician replace the defective one. In case your phone is still under warranty, let your provider's technician handle all the hard work so as not to void your warranty. In short, if you can't get the power key to work, let someone who can do it for you. One of the selling points of Samsung Galaxy S5 is its Super AMOLED, 5.1-inch display. It's power-efficient (in Samsung's eyes, at least) and can truly surpass any display technologies used by other manufacturers. It is, therefore, just right that users will be allowed to adjust its properties to their liking. There are five preset screen modes in Galaxy S5, namely; Adapt Display, Dynamic, Standard, Professional photo, and Cinema. It is the default screen mode. What it does is optimize the saturation, color range and sharpness of images while the user is using select apps like Gallery, Camera, Google Play Books, Internet, Smart Remote, and Video. Samsung warned that the feature may not work in some downloaded apps, so it's up to you to test it. This screen mode will best work when your outdoors or in an environment with high ambient light. The saturation of the color will offset outdoor glares that are often reflected on the glass. It optimizes the tone of the display to give more vivid images like that of the Adapt Display mode but it works regardless whether you are inside an app or on any screen. Images will standout even if you're outdoor or in an environment where there is too much light. It is recommended you switch to other modes when you're in a low light environment because it may become uncomfortable the longer you look at the screen. As what the term implies, the color range, saturation and sharpness are pretty "standard" when this mode is on. However, due to the fact that the phone has a Super AMOLED display, the picture it projects may still be better compared with smartphones that has the standard LCD screens. The Adapt Display uses the standard color saturation as well, although, it will change once the phone detects the user is in one of the apps the mode is supposed to work. If you're used to looking at pictures taken by DSLR cameras, you may say that the picture projected on the screen by this mode has the same (or very close) color range and saturation. The screen is set to display accurate colors when this mode is on. You can try to compare by copying the picture taken by a DSLR camera to your phone and view it with Professional Photo screen mode on. According to some experts, Cinema Mode makes the screen of the Galaxy S5 projects images with very accurate colors. If a user is indoors or in environment with low ambient light, this mode will be a perfect choice for viewing photos, watching movies and TV shows. It's all about your personal preference and color orientation. Others are used to viewing pictures in all their glory while many are used to viewing images with standard color range, sharpness and saturation. It's all about what you like and how comfortable your eyes are when viewing images. The Samsung Galaxy S5 has a feature that automatically adjust screen tone. It analyzes on-screen images and amount of light in the surroundings to produce a more appropriate screen tone. The feature helps in saving up battery as well as make the screen soft to the eyes of the user. For my readers who have been asking me why the screen of their phones change the level of brightness most of the time, it's either the Auto brightness that's causing that or this feature. From the top of the screen, swipe your finger to the bottom to pull down the Notification panel. Tap the Settings icon (cogwheel). Scroll to Sound and display section. Tick the checkbox next to Auto adjust screen tone to turn it on. Enter 'auto adjust screen tone' and tap the search icon. In the next page, under Settings section, tick the checkbox next to Auto adjust screen tone. I hope this short post helped you somehow. Feel free to leave a comment if you have questions, clarifications or problems with your phone. Samsung Galaxy S5 power problems are often attributed to a failing battery, if not, then the USB Charge Port is the next suspect. I listed several issues a user may encounter if the component fails or got damaged. After troubleshooting and all signs are pointing to the USB Charge Port being damaged, there's no way you can fix it without replacing the entire component. You may need the services of a technician for this. In the latter part, I also cited easy ways on how to troubleshoot issues with the back or primary camera. Again, if the component is proven defective, it must be replaced and the good thing is it's very serviceable, although, the phone needs to be opened naked to be able to remove the sensor. I hope you can learn a thing or two after reading this post. If you have questions, feel free to leave a comment and I will get back to you as soon as I can. Galaxy S5 charges slowly or not at all. It may cause random reboots and quicker battery drain. The phone may not power on. Audio recording may be affected. The device's capacity to find signal may deteriorate. Again, the component can easily be detached from the motherboard, so it can be replaced with a new one provided all signs are pointing to the USB charge port as defective. This is the primary camera with 16-megapixel sensor conveniently located at the back of your phone. For people who were getting the "camera failed" error message since day 1, contact your provider as soon as possible as it is a possible manufacturing defect. If you're getting the error recently, try to wipe the cache and data of the Camera app and/or perform factory reset and if the problem won't go away, negotiate with your provider at once. In the event that your phone snaps fuzzy, blurry pictures and videos or if there are visible tiny lines, try cleaning the lens and if that won't fix the problem, there may be scratches on the lens and it needs to be replaced. For pictures that look distorted, try to disable all filters first, then take another picture. If that picture shows the same distortion, download it to other device or computer and try to see if it still distorted and if not, then the problem is with the screen of your phone and not the camera. Another issue that any owner might encounter is the lag after taking a picture. It may seem like the camera app is the problem, it's usually not. It's often the Gallery app that's lagging, or at least other services linked to the app. It is, however, recommended you clear both the cache and data of the camera app and then the Gallery. Don't worry, your photos will not be deleted if you do so. Another thing I want to address is about the rattling inside the camera sensor--it's normal. The noise is actually unnoticeable and can only be heard if the camera is not used when the phone is shaken. Don't worry about it! Don't forget to leave a comment below should you have questions or other issues. The battery is the main power source of the phone. Without it your Galaxy S5 will be just another expensive paperweight. It is located underneath the back cover and is removable, needless to say, it is also replaceable. The company touted of the phone's better power-saving mode and that might be one of the reasons why it only gave the new flagship 2,800mAh battery, a slight upgrade from S4's 2,600mAh batty. Are there any liquid elements present? Does the battery have physical deformities like lumps or signs of swelling? Plug the charger in and let the device charge for, at least, 10 minutes and while waiting for the time to elapse, look for signs that the phone is properly charging. You should see the LED glowing red and the usual "charging" symbol on the screen. If the phone doesn't show the usual charging signs, remove the back cover, pull the battery out and try to mount it properly, and then attempt to charge again. For a totally depleted battery, it would take several minutes before the indicators light up, so try to wait that long. After several minutes have elapsed and the charging signs don't show or the phone won't power on, pull the battery out and check the liquid damage indicator (LDI), the little sticker in the battery compartment. If the little sticker is white, then the phone doesn't have water damage, however, if it turned pink, red or purple, the liquid found its way inside. It is also wise to check the battery for swelling, lumps or leaks. A battery that manifests any of those needs to be replaced as soon as possible. Defective or damaged batteries have a tendency to over-charge and explode. WARNING: Do not attempt to open or repair the battery. Just don’t! If you don't want to buy a spare battery, it would be wise to borrow from someone who has the same phone as you. One of the factors that could cause battery drain issue to occur on your mobile device like the Galaxy S4 or S5 is when you set the device to automatically check for new email messages. This is because the phone will access the mobile network more often. Good thing there's an option for you to manage this automatic setting, and turn it down or off your device. This content will walk you through adjusting or changing the email syncing frequency on your Samsung Galaxy S4 and S5 devices. Read on to learn more. 2. Tap Email to continue. 3. Next, tap the Menu button (key). 4. Scroll to and tap to select Settings from the given options. 5. Under Settings, tap the email account. 6. Scroll to and tap Sync schedule under Sync settings. 7. Tap Sync schedule to view available schedule to sync. 8. Tap the sync schedule option you prefer. For example, Every hour. 9. Now tap on Peak Schedule. 10. Tap the peak schedule option you prefer. For example, Every hour. And that should do it. The settings have already been changed. 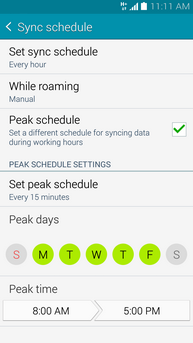 Follow the same steps if you want to set it to a different sync and peak schedule options. 3. Tap the Menu icon (three-vertical-dots) located on the upper right corner of the screen. 4. Tap to select Settings from the given options. 5. 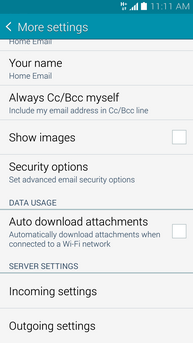 From the Settings screen, tap on Manage accounts to configure email account settings. 6. Tap on the email account you want to configure or manage. 7. Tap on Sync settings to continue. 8. Under Sync settings, tap Sync schedule. 9. Now, tap on Set sync schedule to get to the available schedule options. 10. Tap on the sync schedule option you want. For example, Every hour. And by doing all that, the email syncing frequency on your Galaxy S5 has already been changed. Just follow the same steps to change it to a different schedule you want. One of the tested workarounds to deal with an email-associated issue on a mobile device like the Galaxy S5 is through verification and re-configuration of the email settings on the phone. And this content will walk you through this process. This method can be applied in situations like when you cannot send or receive email as well as if you cannot get the email server to connect. It may be necessary for you to update the email server settings and ensure the settings are correct and working fine on a home computer. To make sure you are using the correct settings, please contact your email provider or ISP to verify the correct email settings for your account. Also ensure you are connected to the Internet. If you're in need of further assistance in changing the email settings on your Galaxy S5 device, then you too may refer to this guide and perform the following steps whenever you're ready. 1. Get to your phone and tap Apps from the Home screen to begin with. 2. Next, tap on Email. 3. On the next screen, tap the Menu icon located on the upper-right corner (represented by a three-vertical-dots icon). 4. You will be prompted with a list of options. Scroll to and tap on Settings. 5. From the Settings screen, tap on Manage accounts to view available accounts on the phone and edit your preferred email account settings or the one that's having an issue. 6. Tap on the account you want to configure or fix. 7. Scroll to and tap on More settings to continue. 8. Under More settings, you will see the available options to configure. The most common settings to edit or change are the outgoing settings, so scroll to and tap on Outgoing settings. 9. Tap on SMTP server from the Outgoing settings screen. 10. View and edit the SMTP server name if necessary. Be sure to enter the correct information for this field. 11. Next, scroll to and tap on Port to view and check the port number. To edit the port number, just erase the existing one (if there's any) and replace it with the correct port number. 12. After ensuring setting is configured correctly, tap on Done to save the changes you made. The process is actually similar on most email accounts. The available options that can be changed may vary depending on the account you're editing or working on, like Gmail, Yahoo!, Outlook, Microsoft Exchange, etc. The new Samsung Galaxy Note 4 device is packed with several screens and settings along with various features that would make phone handling a lot easier and more convenient with only one hand. This tutorial will teach you how to use your Note 4 device with one hand. How to Reduce Screen Size with One Hand on your Note 4 device? Note: If you don't see One-handed operation in the Settings menu, tap on Display and wallpaper and then select One-handed operation. Please note that the available screens and settings may vary between wireless service provider and software version. 4. Tap on Reduce screen size. 5. Touch the slider to turn ON or enable Reduce screen size option. You can enable the feature at any time by swiping your thumb from the edge of the screen to the middle and back. You should see the display reduces to a size where you can reach most features with your thumb. At the bottom of the screen, the icons for Recent apps, Home, Back, and Volume Up/Down keys are also displayed allowing you to put them in reach of your thumb. To resize the screen, touch and drag the Reduce-display-resize icon located in the upper left corner of the screen. To move the smaller window around the screen, touch and hold the top bar. To exit one-handed display, touch the Reduce-display-expand icon and get back to the full-screen display. Again, if One-handed operation is not available in the Settings menu, then tap on Display and wallpaper and then select One-handed operation. 5. Touch the slider to turn the feature ON. When the One-handed input is enabled, you should see the dialing keypad becomes smaller, allowing you to touch the arrow and move it to the other side of the screen with your thumb. You can display up to four quick access buttons within easy reach of your thumb by enabling or turning on the Side key panel feature on your Galaxy Note 4. Among the options available in the panel include the Reduce apps, as well as the Home and Back keys. You can also access the Reduce screen size feature, the Apps menu, and More options quickly in the panel, depending on the content you are viewing. Alternately, tap on Display and wallpaper and then select One-handed operation. 4. Tap on Side Key Panel. 5. Touch the slider to turn Side key panel on or enable the feature. Touch and hold the SideKey Move icon to move the Side key panel around the screen and then drag it to a new location. Touch and hold the SideKey Move icon and then drag it to Remove (trash icon) at the top of the screen, to remove the Side key panel. Among other available options you can configure in the Side Key Panel Settings include Transparency, Quick Minimize, and Manage Keys. Transparency - this option is used to move the slider to increase or decrease the transparency of the panel. To use it, touch on Transparency in the Side key panel settings. To make the panel disappear completely when minimized, put a check mark in the box next to Hide panel when minimized. Quick Minimize - this option is used to minimize the buttons to a white line on the side of the screen. By default, the checkbox next to this option is marked. To see how it works, touch the outside of the panel. If you want to keep the panel open at all times, unmark or remove the check mark in the box. Hint: If you want to access the panel after minimizing it, simply swipe the corner of the screen where the panel is shown. Manage Keys - this option is used to edit which keys are shown in the Side key panel. To do so, simply touch Manage keys. To add or remove a key from the panel, or rearrange the order of the keys, simply touch and drag the key. 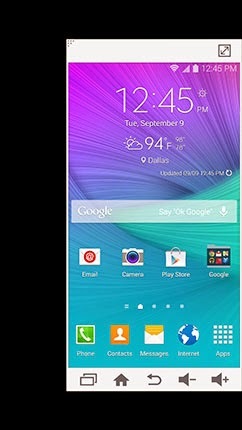 And that covers everything on this Galaxy Note 4 tutorial. Welcome to the first part of yet another troubleshooting assistance we created for users of Samsung Galaxy S5 who are having problems with the device's lock. The given solutions, workarounds and recommendations in this content are standard procedures offered by the device manufacturer that are used to troubleshoot and resolve an existing problem on the GS5 device. What if it won't work? Covered in the first part are methods to deal with a problem on the Galaxy S5, in which the user is unable to unlock the device using face unlock. If you too are experiencing the same problem, then I suggest you keep on reading and try any of the possible resolution methods introduced in this page, especially the ones you haven't done yet. Nevertheless, we are not really forcing you to follow or try our offered solutions. That being said, the final decision will still be yours to make. To make the problem more specific, we'll put it this way. You are unable to unlock your device using Face unlock and that you are getting an error prompt saying, "Maximum Face Unlock attempts exceeded," and then your device prompts you to "Blink Now." What is this prompt indicates and how to deal with it? 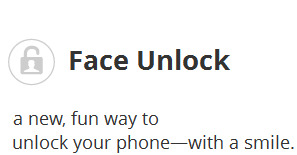 The aforesaid error prompt indicates that your device is somehow unable to recognize your face while you're attempting to unlock it with this method. This could likely be due to the lightning that is too bright or too dim. In some cases, the device won't be able to recognize the details of your face because you don't hold it at eye level, or your face is not aligned within the facial recognition area. It's also possible that you did not blink or maybe an eye-wear is not recognized. Or it could simply because the front-facing camera view is blocked or obstructed. To ensure the problem is not due to any of the aforesaid possible causes, make sure you have checked everything. Here are the first recommended workarounds provided by the manufacturer to deal with this issue. 1. Verify and ensure you are in a well-lit area while attempting to use face unlock. Please note that the device camera may not be able to recognize your face input if the surrounding is dim or overly bright. 2. Verify and ensure there are no barriers or obstructions to the front-facing camera area and make sure it's clean. Try to take off the case or cover if you're using any. 3. Remove any eye-wear (if there's any), hats, masks, and the like. These things may obstruct the view of your face and so the camera won't be able to recognize your face. If you get the same exact message that says, "Maximum Face Unlock attempts exceeded," then you will need to enter your alternate unlock PIN to unlock your device and gain access to it. Once you've accessed the device using your alternate unlock PIN, you can change or set up a Face unlock again. 4. Also make sure you are holding the device at eye level and that you are looking directly at the device while on the Face Unlock screen. 5. Be sure to align your face within the empty space and please don't hold the device close to your face. Holding it close to your face will prevent the camera from detecting your face to unlock the device. 6. Hold the device still until your device recognizes your face and it unlocks. If you have activated or enabled the Presence check on the device, you will be prompted ti Blink now after your face is detected. Doing so will prevent someone from holding up a photograph to unlock your device. So just do as it says. Note: Face Unlock must be the selected first or set as current lock method on the device for you to enable and use Presence check. 1. Tap on Menu from the Home screen. 3. Tap on My Device. 5. Tap on Presence check to enable or turn the feature ON. If you still can't unlock your device using Face Unlock after performing all the aforementioned workarounds, then try to use another unlock method instead. Usually, you will be prompted to enter your alternate password after several unlock attempts you've made using Face unlock. Just be sure to enter the correct PIN for you to access your device and then edit device unlock settings/options. And that will cover everything in this troubleshooting guide. More about device unlock problems will be tackled in our next posts, so please stay tuned.